At a height of 4 m, two slots have been chiseled into a wall. 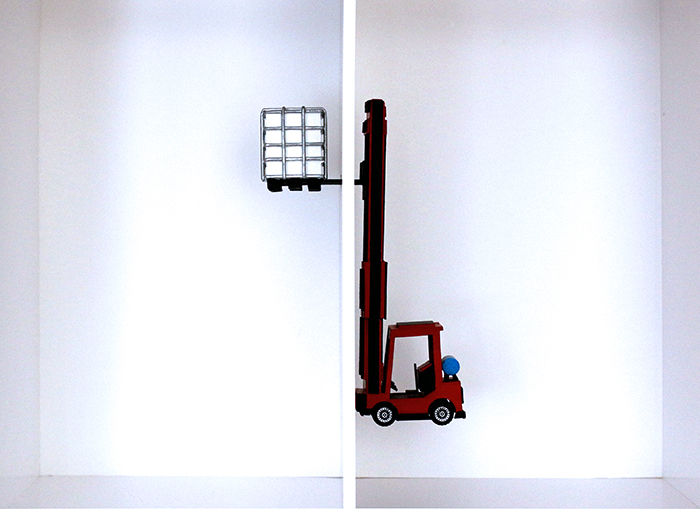 The distance between the slots corresponds to the distance between the prongs of the forklift. The lift mast of the forklift truck is fully extended. A Manitou lifts the forklift upward, drives up to the wall and pushes the prongs of the forklift all the way through the two slots. On the prongs of the fork, which protrude through to on the other side of the wall, an IBC tank filled with 1000 liters of water is placed. The forklift is suspended one meter above the ground.